“I like to hear a clock ticking in my pictures.” So said Deborah Turbeville, the legendary photographer who passed away in October. Turbeville had a feeling for time: She preferred to shoot in derelict places, ruins of a kind, and her soft-focus images had the spectral quality of memory. Her photographs were so, so beautiful, and part of what made them so was that they were marked by a sense of loss. Turbeville was part of the trio of photographers that emerged in the 1970s who changed the tone, and indeed the very nature, of fashion photography. Alongside Guy Bourdin and Helmut Newton, she introduced the atmospheres of sensuality, mystery and dark glamour we now take for granted in fashion pictures. Turbeville’s contribution was a particularly poetic and dreamy one, her signature shot a tableau of lithe, languorous models arranged in a forgotten room with paint peeling off the walls. Her relationship with Valentino was established relatively early in her career, and it lasted until the end of it. Turbeville shot her first Valentino campaign for the Fall/Winter 1977 collection; she shot her final Valentino campaign for Spring/Summer 2012. 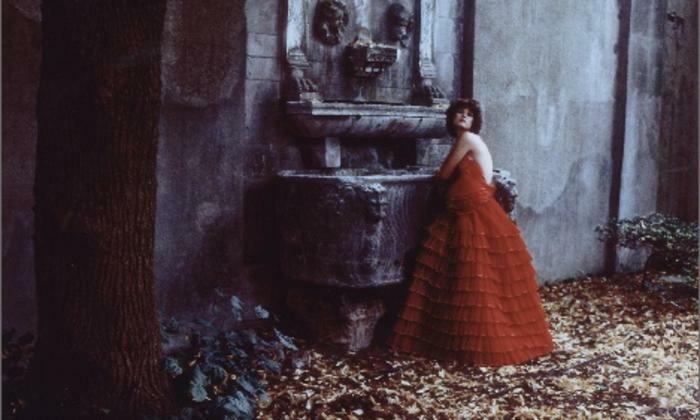 In the intervening years, she shot for virtually every major fashion magazine, and produced numerous books, including the indelible Unseen Versailles (1982), a view of the palaces hidden nooks and back rooms that was commissioned by Jacqueline Onassis. Another treatment of hidden spaces was Turbeville’s behind-the-scenes photographs of the Valentino atelier in Rome, which she shot for the magazine Harpers & Queen in 1993. The portfolio was a key element in last year’s major Valentino retrospective at London’s Somerset House, Valentino: Master of Couture, and was reproduced for the book of the same title that accompanied the exhibition. Her influence lives on.